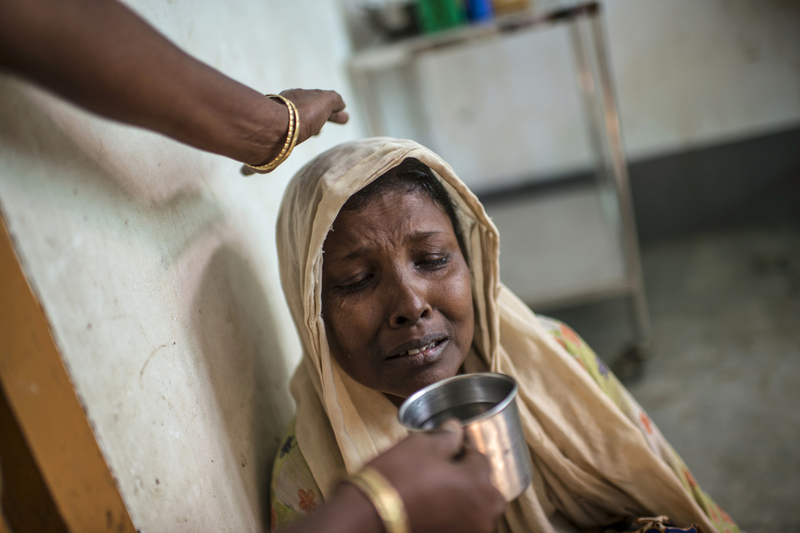 Moriam Katu, 50 years, who is gravely ill from severe asthma, is offered water as she struggles to breathe in the That Kay Pin Emergency Hospital in the camp for Internally Displaced Rohingya outside of Sittwe, in Myanmar, November 25, 2015. Moriam was so ill, she could barely breathe, and began coughing up blood. She visited the emergency hospital at the That Kay Pin within the IDP camp, and there were not sufficient resources to treat her there. The medical advisor offered to transfer her to the government hospital in Sittwe, but she declined, because her family did not have enough money to keep her there. While her medical treatment would be free, her guardian would need to pay for food, which they estimated would be 20-30,000 for food for a week. She declined and went back home. A few days later, she returned, and was transferred to Sittwe hospital, and died 10 days later. An estimated one million stateless Rohingya have been stripped of their citizenship in Myanmar, and forced to live in modern-day concentration camps, surrounded by government military checkpoints. They are not able to leave, to work outside the camps, do not have access to basic medical care, or food. Most aid groups are banned from entering or working in the camps, leaving the Rohingya to their own devices for sustenance and healthcare. Journalists are also routinely denied access to the Rohingya, Myanmar’s way of ensuring the world doesn’t see the slow, intentional demise of a population.